By 2030, it’ll look more like a lush park than a crowded metropolis. The Island-City of Singapore has a population of almost 6 million people for a territory of 700 square km (277.6 square miles) meaning that the city has a population density of almost 8,000 people per square km (20,000 per square mile). This marks Singapore as the third most densely populated country in the world. For reference, the United States stands as the 182nd country by population density, with 33 people per square km (85.5 per square mile). Currently, it’s estimated that densely populated urban areas contribute up to 70 percent of Greenhouse Gas emissions even though they cover only 2 percent of the world’s area. This is alarming for environmentalists, because urban cities are quickly replacing rural lands in keeping with the rate of globalization and increasing population. 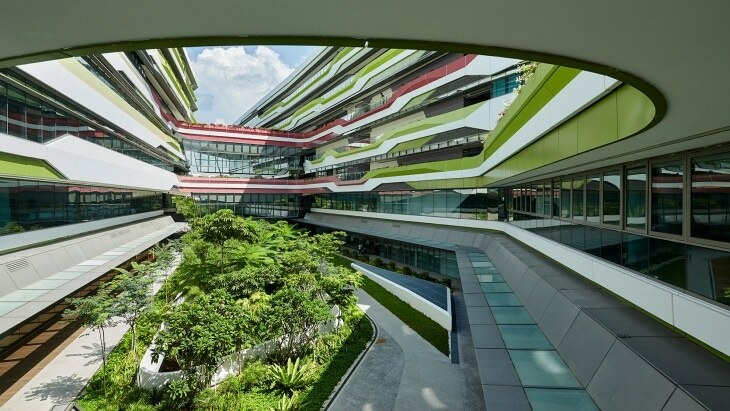 Singapore, however, has planned to pivot its city through a green initiative since 2008. The country’s vision to establish green buildings can be chiefly attributed to the first woman to lead the country’s urban development agency. She is Cheong Koon Hean, a veteran architect and the CEO of the Housing and Development Board, which builds and manages public housing for Singapore’s population. Hean believes in an incentive policy that mandates 100 percent greenery replacement, which requires that any plant life lost destroyed by city development must be replaced by greenery planted on high-rise terraces and gardens. Heon doesn’t see going green as an option, but as a necessity for a city such as Singapore. She argues that Singapore’s land constraints give the country no choice but to adopt high-density development. Despite the crowds and sky scrapers, Singapore can use hues of blue and green to create an illusion of space and reducing the feeling of density. Heon aims to hit the green mark rating by 2030 and hopes other similarly dense cities will follow suit. Other cities can develop buildings that conserve both energy and water and improve the indoor environment. Through solar panels, improved insulation, enhanced ventilation, eco-friendly building materials, light-based modulated sunlight, water conservation, and many other techniques — modern day buildings in the densest cities around the world can do their part to reduce carbon emissions.